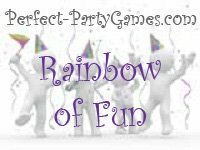 Summary: Rainbow of Fun is a group game where the players get to know each other better by using bright colored candy and questions. Colored candies: some of the popular candies are M&M's, Skittles, Mike and Ikes, Jelly Bellies or my favorite are Rainbow Drops. Pour the candies in a bowl and set in the middle of a table. Be creative and choose any questions you think would be fitting for your group. The host will then call out the color topic and everyone will go around the room sharing one answer per colored candy. For instance, if you chose two red pieces of candy, you will have to name two of your favorite hobbies. After the player has shared that color with the group, they may then eat their candy of that color only. Continue to go around the room until each color topic has been shared. For the question category, blue candy in this example, use the Get to Know You Questionspage. Print the page and number the questions. Let the player answering the questions choose what number question they want to answer. If some of the questions are not age appropriate, then simply do not number that question.